Hot off Takuya Yamashiro's spectacular entrance into the ongoing Spider-Verse comics event, Marvel are celebrating the finest Live-action adaptation of Spidey by streaming the first and seventh episodes of the series online. Watch them, and bask in the absurdity that is Supaidaman! It's not the first time Marvel has made episodes available ( they did so previously in 2009) but it's still a rare enough occurrence that you get to enjoy this wacky, delightful show - one that had a big impact on the evolution of the Sentai genre itself. 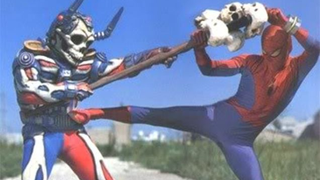 The two episodes are perhaps the best to show off the tonal craziness of the series - the first is the pilot, which sees Takuya gain the powers of the Spider suit and his giant mech, Leopardon, and become everyone's favourite neighbourhood friendly Spider-Man emissary of Hell, and the second has cyborg rock stars. BECAUSE OF COURSE IT DOES. Without further ado, go to the link below for the two episodes.